The Prime Minister, Peter O’Neill has welcomed the ground turning at the site of the new APEC Haus that will host the APEC Leaders Summit in 2018. APEC Haus will be built on reclaimed land at the juncture of Ela Beach and the Paga Hill Ring Road, and is being undertaken by Oil Search Ltd through a tax credit scheme as was approved by the National Executive Council. PM O’ Neill said the building will be the focus go global attention during APEC, and will be a national icon that will be used by generations of Papua New Guineans in the decades ahead. "In 2018 we will welcome the Leaders of the other 20 APEC countries to APEC Haus,” the Prime Minister said. “The building will have two levels on an island that is being reclaimed just off the foreshore. The Prime Minister said Papua New Guinea’s hosting of APEC will deliver a number benefits for the nation in several areas. "While the focus of the APEC meetings is policy development, for Papua New Guinea this will be a chance to showcase our country and our economy to the rest of the world. “Across the Asia-Pacific and around the world people will learn more about Papua New Guinea, our culture and tradition, and the investment opportunities in our country. 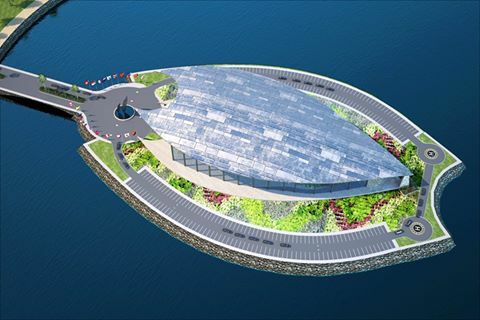 "APEC Haus will host the main Leaders summit as well as the Leaders dialogue with the APEC Business Advisory Council. “After APEC the building will serve a number of purposes that includes hosting functions such as weddings and musical events, will have shops and restaurants, and will likely have a museum of national artefacts. “The room where Leaders meet will likely be kept in place after the meeting and become a tourist attraction in itself and host board meetings and other events. “In other countries where they have kept their meeting table people love to come and sit in the same seat and desk where the American, Chinese or Russian President sat. The final cost of the building is in the process of being estimated and engineering designs are finalised, but the cost will be absorbed by Oil Search through a tax credit scheme similar to construction that has been used in the past. This includes the National Rugby League Stadium and the renovation of the Pineapple Building to become Sir Manasupe Haus. "I would like to thank Oil Search for partnering with the Government on this project to build Papua New Guinea’s APEC Haus. “We have worked very will in the past with Oil Search to build national infrastructure and this has had a favourable outcome for all parties.